Whether you spend a lot of time preparing the holiday feast, or are a guest at the dinner table of a friend or family member, you can appreciate a properly set table. A table that is set well makes the dining experience that much more enjoyable. 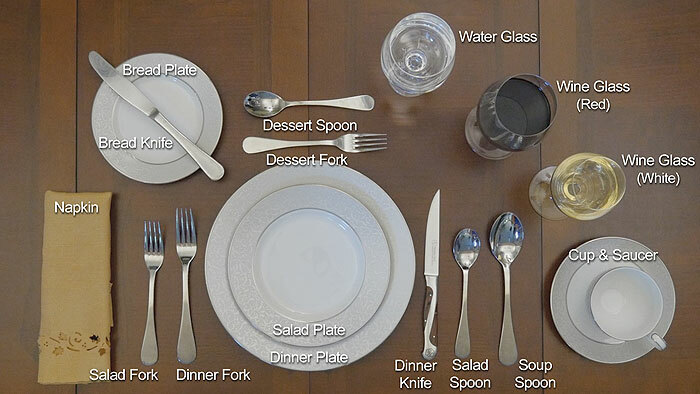 There's no wondering which fork to use next or which glass is yours, when everything is in it's place. After many years of being asked by family and friends, "how do you properly set a table" I decided to put together this short video of the format I use. I hope you find it beneficial this holiday season. I could have definitely used this last year at Christmas! I was clueless! Great tips for upcoming dinner parties and holiday gatherings! I love this! My grandma used to properly set the table every year for Thanksgiving. I remember as a child thinking it was so special! Thanks for sharing! This is awesome and so helpful. I'm going to share on my page! I haven't set a table...like, really set a table...in years (we just don't have the space). Great informational post! Love the video and the photo! Perfect for this week! What a great idea for those that need help in how to set the table! Beautifully set table, thank you for the video! Very helpful info to have. Sooooooooo much silverware :) My problem is that the food usually takes up 99.2% of the table, so there's not enough room for a full place setting! Seriously great tip! Perfect doing the holiday season!